Greece's economy is living on borrowed time—particularly if you believe the old adage that time is money. That's because Greek banks have for months been relying heavily on what is called "emergency liquidity assistance" from the European Central Bank for just more than 80 billion euros ($90 billion). Otherwise known as ELA, emergency liquidity assistance is a loan program available for national banks in distress, allowing access to cash at an interest rate set by the ECB's Governing Council. All of the risk falls on Greece if the loan can't be repaid, unlike normal circumstances when a country has adequate collateral to offer and can receive a loan from the ECB at a lower interest rate. 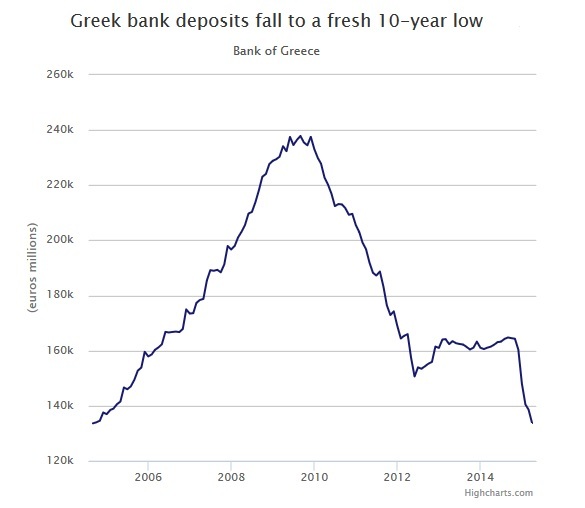 But since the ECB rejected Greek bonds as collateral, ELA has become the last resort for the troubled nation that's seeing deposit outflows in commercial banks peak at 300 million euros a day. Without ELA propping up Greece's commercial banking system, banks would be called to repay the National Bank of Greece. Without enough cash to do just that, banks could close, deposits could be lost, depression could ensue. It's powerful leverage the ECB holds. From all indications, however, the ECB remains dedicated to keeping Greece in the euro zone, and a risky move like that could lead to unforeseen consequences that carry the potential to backfire. But it wouldn't be the first time the possibility has arisen. When Ireland had become increasingly reliant on ELA—peaking at 187 billion euros in 2011—the ECB reportedly used the notion of cutting the emergency funds if Dublin didn't agree to bailout terms, which the country later did. In 2013 Cyprus turned to emergency liquidity assistance after the ECB, similarly to the Greece case, refused to accept the country's sovereign bonds as collateral. Cyprus too faced warnings that the ECB's Governing Council was prepared to reject the continuation of ELA. The country later entered a rescue program and imposed capital controls to restore solvency to its banks. Greece has until the end of the month before its next debt payment is due. Parliamentary speaker Zoe Konstantopoulou has dismissed the Bank’s hard-hitting report as “totally unacceptable”, and returned it to BoG governor Yiannis Stournaras. Stournaras was finance minister in the previous coalition government led by the right-wing New Democracy party, which enforced many of the austerity measures which Syriza has vowed to overturn. As such, there is no love lost with the Syriza-led government, given their views are almost diametrically opposite. Some MPs are now demanding that Stournaras explain himself to parliament, flags up journalist Sophia Ignatidou. In my opinion, Stournaras was the best finance minister that Greece ever had and the report the Bank of Greece put out is quite sensible. But this is Greece, so everything gets politicized to the point of absurdity. "The more the deposit flight goes on, the easier Grexit will be," said one Syriza MP. "It is a trump card," said another (click on image below). Perhaps his Italian heritage is what led Sabia to those comments but even he didn't fathom the extent of the mess going on right now in Greece and how it can spread to the rest of Europe. 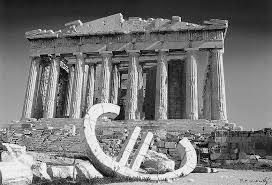 The crisis in Greece has brought about a slew of anti-Greek articles in Germany and elsewhere. Some of these articles border on racist and others like the ones recently written by Anatole Kaletsky and Roger Cohen are equally idiotic and serve no purpose but to fan the flames of hatred toward "lazy Greeks" who "don't understand the gravity of the situation." What are my thoughts on all this? I've written two comments recently on a Greek suicide and on who will blink first. I've explained why far from being an enemy to Greece, the ECB has aided and abated Varoufakis's great game with its emergency liquidity assistance (ELA) program. 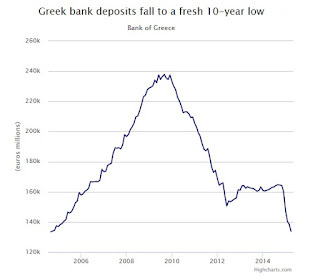 This is why I don't see the ECB moving ahead to cut off its life-support to Greek banks. A move of that magnitude will be viewed as political blackmail by the radical Left in Syriza and basically cement their views to go ahead with the 'Icelandic option', at which point all hell will break loose. I still maintain that cooler heads will prevail and that eurozone's creditors will cave in to the IMF's demands to write off some of Greece's debt. Importantly, Tsipras and Varoufakis won't blink; they simply can't. If they do, they risk a huge uproar from the radical left fringes within their government which sees more austerity measures as the perpetuity of failed policies which have destroyed the Greek economy. Whether or not you like Syriza -- and I certainly don't -- there is a lot of truth to these "radical left" arguments. Imposing harsh austerity on a country suffering debt deflation will only exacerbate its economic crisis, not solve it. And the situation in Greece is really screwed up because as I've repeatedly stated, austerity measures have disproportionately hurt the private sector. The over-bloated and inefficient public sector is thriving and expanding, which makes the situation that much more twisted. Why? Because all this uncertainty hanging over Greece is decimating private sector jobs and that ratio I keep talking about -- 1.5M Greek public sector workers vs 2.5M Greek private sector workers -- keeps surging higher, forcing the few remaining in the private sector to pay more taxes to support this bloated and inefficient public sector. At the start of a make-or-break week for Alexis Tsipras’s government, it is a fact that Greece is now seen in many European capitals as a state that refuses to modernise and must therefore depart the eurozone, if not the EU altogether. This view might be understandable, but it is wrong. Understandable due to the antics of a Greek government that has refused to engage in a constructive and competent manner with its creditors. Wrong because it is based on false assumptions about what has been accomplished in Greece over the past five years, about what a consistent majority of the Greek population wants, and about what the consequences would be for Europe. Ultimately, this view is the mirror image of the – similarly understandable but similarly wrong – view held by the current Greek government, that the economic adjustment programme, widely known as the “memorandum”, is the sole source of all the country’s ills. Understandable because there is no doubt that the austerity prescribed as part of the memorandum has contributed to Greece’s great depression in terms of lost output (-25% in real terms) and unemployment rates (peaking at 27.5%). Not only do many of its appointments in key positions owe their jobs to party allegiance rather than competence, but the only common thread to their governing strategy thus far has been a blanket reversal of reforms, good or bad, undertaken by previous governments – seemingly for the sole reason of making a symbolic break with the past. Moreover, the government has failed to articulate a concrete, progressive, forward-looking reform agenda, and move beyond its populist talking points to aggressively embrace the urgently needed structural reforms, many of which are outlined in the memorandum. These include market liberalisation, business environment simplification, an expanded and better targeted social welfare system, a truly meritocratic public administration, privatisation in sectors dominated by inefficient state monopolies, and pension reform. I couldn't agree more. Unfortunately, just like Greece's former finance minister Stefanos Manos who warned Greeks to leave their statist policies behind, I am not optimistic and agree with him, problems will remain unsolved unless Greeks (a) commit to achieve increasing budget surpluses, (b) drastically reduce the size of the civil service and (c) cut back on statism. This is why I empathize with creditors who don't want to write down Greece's debt and keep squeezing the Greek government hard. Even if they forgive all or part of Greece's debt -- a move which is politically unacceptable -- the country will be back in the same position down the road because it's incapable of cutting the public sector down to a more manageable size. Having said this, eurozone creditors are only pouring gas on the Greek debt fire and will get burned with their increasingly asinine demands. They simply can't risk Grexit and the "unknown" of contagion in the periphery economies and a possible backlash in Spain and Italy where leftist parties are waiting to seize their moment. Moreover, the Americans won't stand idly on the sidelines as all this unfolds and possibly triggers a liquidity time bomb and another global economic crisis. There will be pressure on Merkel to step in and force a comprehensive solution to this ongoing crisis. After months of wrangling, the showdown between Greece and its European creditors has come down to a standoff over pensions and taxes. Greece is refusing to acquiesce to demands by its creditors that it cut payments to the elderly and raise the value-added tax on their medicine and electricity. Europe’s demands – ostensibly aimed at ensuring that Greece can service its foreign debt – are petulant, naive, and fundamentally self-destructive. In rejecting them, the Greeks are not playing games; they are trying to stay alive. Whatever one might say about Greece’s past economic policies, its uncompetitive economy, its decision to join the eurozone, or the errors that European banks made when they provided its government with excessive credit, the country’s economic plight is stark. Unemployment stands at 25%. Youth unemployment is at 50%. Greece’s GDP, moreover, has shrunk by 25% since the start of the crisis in 2009. Its government is insolvent. Many of its citizens are hungry. Conditions in Greece today are reminiscent of those in Germany in 1933. Of course, the European Union need not fear the rise of a Greek Hitler, not only because it could easily crush such a regime, but also – and more important – because Greece’s democracy has proved impressively mature throughout the crisis. But there is something that the EU should fear: destitution within its borders and the pernicious consequences for the continent’s politics and society. Unfortunately, the continent remains split along tribal lines. Germans, Finns, Slovaks, and Dutch – among others – have no time for the suffering of Greeks. Their political leaders tend to their own, not to Europe in any true sense. Relief for Greece is an especially fraught issue in countries where far-right parties are on the rise or center-right governments face popular left-wing opposition. To be sure, European politicians are not blind to what is happening in Greece. Nor have they been completely passive. At the beginning of the crisis, Greece’s European creditors eschewed debt relief and charged punitive interest rates on bailout funds. But, as Greeks’ suffering intensified, policymakers pressed private-sector banks and other bondholders to write off most of their claims. At each stage of the crisis, they have done only what they believed their national politics would bear – no more. In particular, Europe’s politicians are balking at steps that would implicate taxpayers directly. The Greek government has asked Europe to swap existing debts with new debts to lock in low interest rates and long maturities. It has also requested that interest payments be linked to economic growth. (It has notably not asked for cuts in the face value of its debt). But debt relief of this sort vis-à-vis European governments or the European Central Bank has been kept off the table. Such measures would likely require parliamentary votes in countries across the eurozone, where many governments would face intense public opposition – no matter how obvious the need. Rather than confront the political obstacles, Europe’s leaders are hiding behind a mountain of pious, nonsensical rhetoric. Some insist that Greece finish its payment program, regardless of the humanitarian and economic consequences – not to mention the failure of all previous Greek governments to meet its terms. Others pretend to worry about the moral-hazard implications of debt relief, despite the fact that the country’s private-sector debt has already been written off at EU insistence, and that there are dozens, if not hundreds, of precedents for restructuring the debts of insolvent sovereigns. Several European countries now seem content to force Greece into an outright default and provoke its exit from the euro. They believe that the fallout can be contained without panic or contagion. That is typical wishful thinking among politicians. Indeed, it is the type of heedlessness that led US Treasury Secretary Hank Paulson to let Lehman Brothers fail in September 2008, ostensibly to teach the market a “lesson.” Some lesson; we are still digging out from Paulson’s monumental mistake. Sachs's devastating critique should be borne in mind as European politicians meet in Luxembourg for yet another "emergency meeting" where they will keep pressing their demands on Greece and Tsipras and Varoufakis will tell them to "stick it where the sun don't shine." The world is waiting for real European leadership. There is no more time left for Greece and Europe. If they bungle this up, they will risk another global economic crisis, and possibly worse. Below, ahead of a crucial meeting of finance ministers on Thursday which could decide the fate of Greece in the eurozone, investors are gearing up for further heightened volatility in European government bond markets. Also, the Greek central bank has warned the country will be put on a "painful course" if the government and its international creditors fail to reach an agreement on an aid-for-reforms deal. David Pollard looks at the latest developments.